Mal tries to threaten Harold into selling him the Coffee Shop, but Harold is able to see his tactics. Maggie tells Evan he must open up his feelings to her, or their marriage will be over. EVAN: If you want to know I'm angry. I'm angry because you betrayed us. You and me, we made a vow, a contract. We stood up before the world and we promised to be faithful to each other. EVAN: So you keep saying. But you had feelings for him, and you talked to him about it. Before you talked to me. So plenty happened, Maggie. And you let it happen, and you know that. And I'm angry, because you just brought it all back. All that pain with Genevieve, it was as if, our years together just counted for nothing. EVAN: And the worst. You wanted to hear this. The worst is, you took any bit of self respect I might have, and just threw it away. EVAN: You told me that Toadie made you feel alive. Can you imagine how that made me feel? You made me feel, like..... I don't cut it as a husband. Or as a man. You want to know how I feel? That's how I feel. You satisfied? MAGGIE: Why didn't you tell me? EVAN: Because I don't work like that. I don't just blurt out my emotions at the drop of a hat. MAGGIE: I just wanted to know the truth that's all, so that we can move through this, and move on. EVAN: I don't know if we can move on, Maggie. I don't even know if I want to get through this. You want to know how I feel? That's it. Happy? Evan walks away leaving Maggie looking shocked. Harold finds Mal wandering around the Coffee Shop taking measurements and working out where things are going to go once the takeover happens. Harold tells him that there will be no takeover and tells him to leave the premises. Mal tells him that fighting it won't stop it happening, and warns Harold it will take place even if he doesn't want it to. He leaves. Connor and Michelle are doing the washing up. He comments on how she's not doing it properly, and Joe walks in to find them having a 'bubble war'. He sends Connor to go and dry off, and tells Michelle to get back to the dishes. Michelle asks if he's been able to find a job for Connor yet, as the sooner he gets the job, the sooner he can move out. Matt and Evan carry a removal box through to the lounge. Matt asks if he managed to sort things out with Maggie, and Evan tells him they did. He tells him to keep some plates out for their farewell party in the evening. Matt tells him he's sorry for them having to move, and Evan agrees that QC stands for 'quick cash', but money is not that important and it comes and goes in life. He tells him that he, Em and Leo are what's important in his life. They disappear through to a bedroom and Maggie appears to help Leo and Em sort out a box. Leo asks if she and Evan are going to be splitting up. Maggie hugs them. Connor tells Michelle about Irish stew and hearing that she's never had it before, he tells her that he will make it for her sometime, when he has a bit more cash. Talking of which, Michelle magically pulls out a paper in which she has circled some jobs in the Employment section. Connor tells her that he feels committed to Joe, but will read them later. She asks what the second magic ingredient in the stew is. He tells her it has to be cooked with love. On the other side of the shop, Rosie mentions to Harold how Michelle seems to have a bit of a crush on Connor. Harold admits he hadn't noticed, but Madge did used to tell him he had the blinkers on. Joe wanders in and asks what's going on. He is glad to hear that Connor and Michelle seem to be getting on. Emily arrives with Bob and Audrey in tow. Matt asks her what she's doing so she tells him she's having a tea party so that they can say goodbye. Matt reminds her that Audrey isn't going to be coming with them to their new home. EMILY: No, this is so I can say goodbye to her! And Bob, you have to make sure... you have to promise to look after Audrey, OK? Harold tells Rosie how Mal had come in earlier and walked around like he already owned the place. ROSIE: Cuppa Diem, bog Latin for dish water, you mark my words! Harold agrees, but admits he's not got the financial backing like Cuppa Diem has. At that moment, Lou wanders in. HAROLD: Ah, Lou, you could be of enormous help here. You've got a totally amoral business ethic, and I need advice on how to survive a take over; a hostile takeover. Harold wonders why he's still going on about the pig! (What pig?, ah well, and so we continue to the next chapter, where) Rosie tells Harold that Lou has a good point; to take them on at their own game. ROSE: They're trying to destroy your livelihood Harold. You're perfectly entitled to take every reasonable step to defend yourself. Show them that you're no easy target. Take them on board. Trumpet the virtues of this establishment. LOU: Of course you'll have to lie a bit! ROSIE: Show them, that if they're going to mess with Harold Bishop, they'd better watch out. HAROLD: By golly, you're right you know! Alright, Me shell inherit the earth, but if they think they're going to take over my business, they're in for one hell of a fight, eh! Joe enters to find Michelle counting all her coins. He tells her to remember how long it took her to earn it all before she goes and spends it. She tells him that she will. He grabs his lunch for work and tells her that she's expected to go to the Hancock leaving do that night, but that he won't be home for dinner. He tells her there's pizza in the freezer as it's probably just her and Connor for dinner. She tells him she'll be nice, but he tells her to be civil. Packing up is still well under way, as Evan organises some of the boxes. Matt comes though with a half filled box, so Evan tells him to put the rest of the plates into it. Maggie appears wondering if they've seen Em. Matt tells them the last he saw of them, she was with Audrey. They start calling for her, and head out into the street. Evan wanders around the street yelling for Em, while Maggie appears out of Lou's driveway (doesn't that count as trespassing), calling her name. It takes them a while (for such a small street), but they eventually notice her toy pram in Harold's drive and trespass around the back! Maggie and Evan stumble across Emily saying goodbye to Madge. EMILY: But mum and dad do love each other, I know they do. I just wish things were like they used to be, before mum and dad started yelling at each other. MAGGIE: What are we doing to them? Michelle shoos Harvey away from the kitchen where she is cooking. She goes to check on the candles in the cupboard, but puts them away quickly as Connor arrives through the front door looking for sellotape. MICHELLE: Are you working for Mal? CONNOR: No, I'm working for money! She asks if he's going to be home for dinner, and on figuring that she is cooking, he tells her he'll be there with bells on. Evan and Matt start laying some of the things out for their farewell party that evening. Matt tells him that he'll pay them back, money and everything, one day. Evan tells him not to worry and that he should concentrate on living the rest of his life. MATT: I guess I've been given a second chance. EVAN: Yes, you have, and you've got to grab that with both hands, because most of the time in life you only get one chance. Maggie overhears from the next room. Michelle appears from the bathroom all dressed up and wanders into the kitchen to discover Joe and Connor stirring a big pot of food. She asks what's going on, and Joe is surprised to see her dressed up. She questions why he was home as he said he was going to be working. Joe explains he had some trouble with the cab so took the evening off. He offers her some of the stew he's made, telling her the two most important ingredients are 'top notch meat' and two hungry guys to eat it. Connor and Joe start eating out the pot. Evan is searching to find his keys to go and pick up the rest of the food for the party. Maggie finds them where he always keeps them. She asks to talk, as they can't keep putting it off. MAGGIE: I know I've hurt you and I've disappointed you, and if I could take it all back, I would, but I can't, and it kills me to see you in so much pain. What we have is so precious. Evan, please, please forgive me. I love you so much. The kids arrive in the doorway to see their parents hug. Lou arrives with an offering of flowers from the pub (as he ordered to many, so thought she might like some). 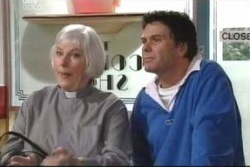 She tells him that Harold is going to be bringing some over later to help brighten up the church too. Lou asks if they can talk privately, and lays the flowers down near some candles. Rosie takes him towards the vestry and we see the flowers start to catch alight from the candles. ROSIE:... shut the door. That's a self locking door that only opens with the key on the other side. So we are stuck her till Harold arrives. Out in the church, the flowers are beginning to burn quite vigorously. Michelle wonders how Connor is able to dig into yet another pizza after the stew, so Connor tells her that men were built with a separate pizza stomach. Mal wonders over, and Michelle asks if he's found a tenant for when he buys the place. Joe tells him to lay off with finding a place for Connor as he doesn't have the money. He tells her to be nice to Connor. 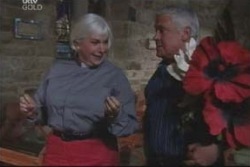 In the Vestry, Rosie asks Lou what he wanted to talk about. He tells her that he is looking forward to having dinner with her and eventually plucks up the courage to kiss her. Out in the church, the fire is getting bigger and other things are starting to catch alight. Everyone gathers around with drinks to hear Maggie and Evan say goodbye. MAGGIE: Yes, we just wanted to say thank you to everybody, for coming today, and that our stay on Ramsay Street has been short and sweet, but we know that the friends we've made over the last twelve months, will be with us for a long time to come. EVAN: In fact, I'm not even sure Ramsay Street knew what it was in for, when the Hancock's blew in, still it's been a real honour and a privilege, to get to know you all, and lets do our best to keep in touch. Um, on a personal note, as you all know, things have been pretty tough for us lately, so I'd just like to publicly thank Maggie, for being a great mother, a sensational lawyer, and the best wife a man could have. I love you, and I always will. So a toast, to Maggie, to our family, and to new beginnings. The church is now ablaze in smoke, travelling off into the distance.